Hah, just discovered something useful.... you can put an iPad (or iPhone, iTouch, and presumably other devices with capacitive-touch displays) in a zip-lock bag, and can interact with the multitouch right through it. Put in the iPad from the bottom, zip it up, and you should be good to go even in a downpour. This'll be convenient for when I use the mapping features on my iPhone while scootering, and to give added piece of mind while reading with the iPad while relaxing in the bath. It'd also be useful to protect against particularly grimy hands, such as when entertaining toddlers, or perhaps for grease monkeys referring to an iPad or answering an iPhone while tuning up the car. In a heavy rain, the raindrops themselves can interact with the screen, so some care is required along those lines. Also, you can't use it underwater because then the entire surface of the device is being interacted with at once, so it essentially shuts down. I tried it. I don't know whether the lack of ventilation would matter for long periods. Heat is transferred through the bag easily, so that doesn't seem to be a concern. I tested with Japanese Ziploc and American Hefty brand bags. Ages ago I did this with my second gen iPod Touch. I would take it into the shawer and listen to music. Worked fine until one of the ziplocks (I had it inside a zip-lock, inside a ziplock) leaked. Or at least I am pretty sure it leaked since the unit froze to a powered black screen. Luckily (I am evil) the water detector strip hadn’t been activated so it got RMA’d. I’ve since stopped bashing Apple products, since if I –who does not deserve it– got customer service then IMHO, Apple has great customer service. PS: I didn’t get away scott-free, the unit I got back has a very weak speaker and was quite scratched. Or you could use this for the grimy toddlers. Tracing function looks pretty neat. 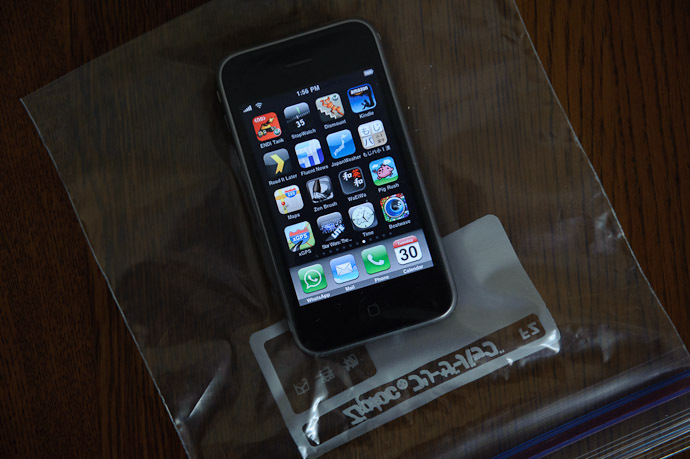 been using a Ziplock since before my Kindle 1 days when my reader was my Sony Clie nx73v. Nice way to even read in the tub though still gotta be careful as a Ziplock can go very wrong very fast. 😉 I use the freezer bags since they are thick. A neat trick I use when using in a damp environment is to toss a desiccator bag (from any source and as a photo-bum & IT guy I am sure ya have more than a few lying around) in with the device. This can help control any potential condensation due to heat build-up/cooling and humidity.